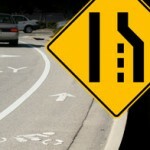 I was recently on the CycleDallas Blogspot and saw this awesome picture. fred_dot_u has proven that he is one to stir up the pot when it comes to making changes in bicycle culture! This is the kind of stuff Mighk mentioned we need to do to change perceptions and culture. Thanks Fred for the wonderful encouragement. I’ve sent a request to eric(at)abcwings.com for quotes. Look for the Night Train to be equipped with this moving billboard all around Orlando soon! 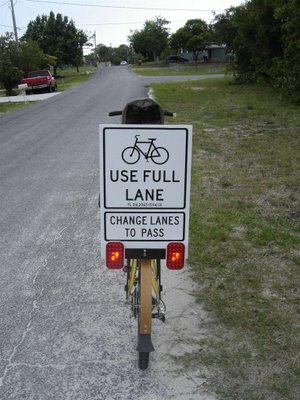 I wouldn’t carry that sign on the back of my bike simply because of aerodynamics, but If it was printed on the back of a jersey or t-shirt, I would wear it all the time. According to Fred, the guy with the sign art (email included in Rodney’s post) can put it on clothing, too. I display that message now! I simply ride where automobiles must change lanes to pass me. I must assume they “get” the message: They all pass me safely in the next lane. Aerodynamics are important to me when it comes to my velomobile, but the tandem is just a couple of slabs pushing big gaping holes in the air and a third one isn’t going to hurt too much anyway. It’s possible, although unlikely that the sign will improve aerodynamics and I can also add a fairing panel or two on each side, with improved conspicuity as well. Don’t ya just love that word, “conspicuity”? It’s as challenging to type as it is to say! I’m hoping that I’m not so much stirring the pot as bringing the ingredients to the surface. I almost said “bringing the ingredients to a (simmer, boil…)”, but that’s certainly not my objective. One more educated motorist is one safer motorist on the roadway. “I display that message now! Yeah, me too. It’s like body language (aka lane positioning), and people seem to get it. The sign is more for the motorists who need us to spell it out for them. I must say I do enjoy the language of lane positioning a lot.